Sonos is sort of the standard for multi-room, full-home sound systems, and now they've upped their game with their brand new flagship store (aka, a freakin’ palace to sound) in SoHo. 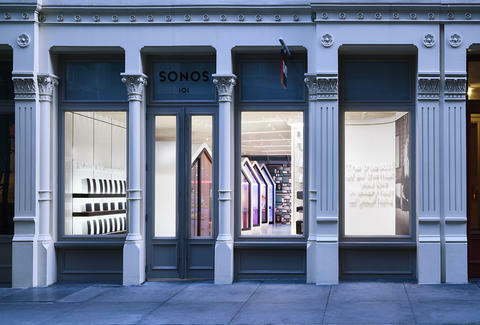 And when it comes to sound technology, the new Sonos store at 101 Greene Street is a serious feat of engineering (it literally took them about 18 tries at the design stage to get it just right). But what does that mean to you, you audiophile, you? We explored. If you're going to build essentially the Taj Mahal to speaker technology in SoHo (one of America's most competitive shopping destinations), your product itself has to be the real deal. And Sonos speakers bring it in a number of ways. First off, Sonos' flagship "PLAY" line features not one, not two, but three separate speaker units to cater to your space (don’t worry, we’ll break ‘em down for you). The PLAY:1 is tiny (but loud), super portable, and it's humidity resistant, so go ahead and put it in the bathroom for some shatter-the-mirror shower singing. The PLAY:3 is the perfect middle ground with just a bit more oomph, but can handily be placed vertically or horizontally so it can shimmy into smaller spaces. And finally, the PLAY:5, is the big daddy, and large enough to fill a small auditorium with waves of sound. They're all controlled from the central Sonos app that lives on your phone or tablet, which pretty much reinvents the whole party sound system (no one likes running from room to room adjusting volumes). And the new Sonos store puts the whole gang front and center, waiting for you to test them all to the limits before you buy and schlep them home. But with such precious aural merchandise, how do you optimize a cutting edge store for real-world use? Well they legit built a full, actual-sized, working prototype of the entire store in a warehouse in SoCal before breaking ground in SoHo, just to make sure they got it right. That's dedication, folks. The materials themselves are a 50-50 split between "absorptive" and "reflective" acoustic surfaces. That means that half of the construction of the space is meant to reflect sound (giving that nice ambient reverb) while the other half is meant to absorb it, giving effectively no echo. What exactly are these materials? Well the floors are mostly concrete (reflective), while the ceilings have a ton of soundproofing absorptive foam. The walls are metal with perforations in them, backed by more of the foam, passing sound through and then absorbing it. This balance, perfected by famous industry production pros (more on them later), creates the ideal ratio of booming, live sound, and clear, studio-quality spatialization. Sonos, as a company, employs some of the industry's leading minds in music production. We know what you're thinking: "Every speaker company probably says that!" We were skeptical, too. But Sonos actually has Rick Rubin (Def Jam founder and producer for way too many classic records to list) and Giles Martin (George Martin's son, like, of the Beatles production team, that George) on their official roster. Martin himself actually assisted in planning the store's construction, and sat in on the final build to make sure the space sounded just right. And when we say that Martin made sure it sounded just right, we mean he did it with painstaking attention to detail. Housed inside the larger space are six 2,000lb house-shaped pods with giant, 800lb glass doors that are almost completely soundproof to the outside room. Inside the pods are all the Sonos speakers, positioned in different corners to mimic Sonos' multi-room playback control. Each one is designed differently and shows off the Sonos multi-room, multi-platform control. But the coolest part is that Giles Martin sat inside each room listening to the same speakers you get to listen to, acoustically tuning and repositioning them to ensure the perfect-sounding space. Now if only you could get him to sit in before your next house party. The Sonos stores has one somewhat secret up its sleeve -- literally in the back, down a flight of stairs, past the 290-unit wall of speakers. And if you can make it past that insanely booming wall of sound, the vinyl room's outfitted with a record player connected to a stereo pair of PLAY:5s along with a nice little collection of, you guessed it, vinyl records perfect for the old-school obsessive. But probably the coolest part of the room is the classic Braun reel-to-reel unit – a recording system used by some of the world’s best classic studios fashioned by the German design legend Dieter Rams. This thing totally belongs in a museum! (yes, that was an Indiana Jones reference). But, you can swing by and see it, and test out all the speakers yourself -- the staff lets you seriously blast these things -- all in the same afternoon, which is something we bet you can do without bugging that wet blanket you call a next door neighbor.